Last night in the Taube Atrium Theater, the San Francisco Contemporary Music Players (SFCMP) launched its 48th season with an on STAGE Series concert entitled Carter and Beyond: Invention and Inspiration. 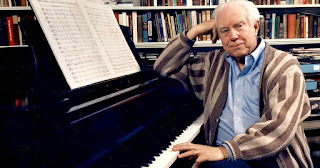 The program was framed by three compositions by Elliott Carter, beginning with two short pieces for solo instrument and concluding with “Penthode,” a 25-minute composition, requiring twenty players organized into five quartets. Within this framework SFCMP presented the world premiere of a woodwind quintet by Asher Tobin Chodos entitled “Big Show” and “Shy Garden,” one of the pieces in Sabrina Schroeder’s Bone Games collection of pieces based on alternative approaches to playing instruments based on electronic transducers and physical techniques involving breath and/or sensitive touch. There is a very strong sense that Carter wished to explore the full extent of sonorities that could be produced by an unamplified guitar. At the same time he seemed to be scrupulously avoiding anything that might be taken as a guitar-like idiom. The result is practically a study in pointillism, where each point seems to have its own characteristic sonority. Only towards the end of the piece does Carter allow the performer to indulge in a bit of strumming (which felt, at least to this listener, like a breath of fresh air)! In last night’s performance David Tanenbaum clearly seemed to have mastered the full extent of sonorities that Carter was exploring, and Tanenbaum’s approach to performance turned those explorations into a journey well worth taking. The other solo composition also left the impression of a journey of exploration. This was “A 6 Letter Letter,” composed for cor anglais and played by Kyle Bruckmann. 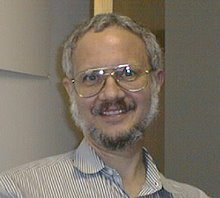 Carter composed the piece in 1996 for the 90th birthday of Paul Sacher, the Swiss conductor responsible for commissioning an almost overwhelming number of twentieth-century compositions. The six letters were those of Sacher’s name, each of which could be translated into a different pitch class. The result amounted to a highly lyrical monologue, based on pitch classes that steered clear of past tonal conventions. Even without a tonal center, however, one could appreciate the wistfulness of the rhetoric as the honoree entering his nineties was honored by a composer with less than two years to go before finishing his eighties. The final work on the program, “Penthode,” was composed about two years after “Changes” and is different in just about every possible way. What was fascinating (and perhaps a bit ironic) about the massive resources required to play “Penthode” was how transparent it all was. With Eric Dudley, the new SFCMP Artistic Director, conducting, it seemed as if every note from every instrument had its own unique clarity. Think again of a study in pointillism, this time on a very large canvas on which none of the points are that close to each other. The ear can “step back from it all” and gradually become aware of how individual notes are juxtaposed even when their respective instruments are distant from each other. Only towards the conclusion does the score seem to home in on an “ensemble sound” (rather the same as the way in which “Changes” falls back on conventional “guitar sounds” near its conclusion). As a composer, Chodos was quoted in the program book as expressing appreciation for Carter’s approaches to polyphony. This made “Big Show” an appropriate “partner piece” for “Penthode,” even if the two pieces were not played consecutively last night. Indeed, “Big Show” deserved to stand on its own, because it was the one piece in the program with a raucous sense of humor. Some of that humor went into naming the three movements after clichés about the American West. However, the deepest impression on me came at the very beginning when I realized that bassoonist Shawn Jones had been drafted into the task of providing a basso continuo. While the other four wind players frolicked, Jones plugged away at a four-square bass line that seemed to owe more to Baroque tradition than to the walking bass behind a big band arrangement. “Shy Garden,” on the other hand, involved gently escorting the attentive listener to the threshold of audibility. Every sound involved some subtle quality, whether it was the resonant vibration of a large drum head or the barely audible sound of a bow being drawn across the body, rather than the string, of a viola. On the basis of what I could learn through a Google search (which, sadly, was not much), I came away from the impression that Bone Games was a cycle of pieces involved with taking sounds normally associated with the background and bringing them to the foreground. Here, again, Dudley was in top form as conductor, leading the ten players with such attentiveness than the willing listener could relish each moment in its own splendid isolation. Perhaps a future season will provide an opportunity to listen to the cycle in its entirety.